The article presents the impact of Jules Verne among Swedish readers around 1900 by investigating a juvenile magazine, Kamraten , published between 1892 and 1911. Two newly discovered Martian Epics in Kamraten by the Swedish author of adventure and crime stories, Julius Regis (1889―1925), “En bröllopsresa i blå etern” (1906―07; “A Honeymoon in Space”) and “Dokumentet från Mars” (1910; “The Document from Mars”), give vivid testimony to Verne’s popularity. 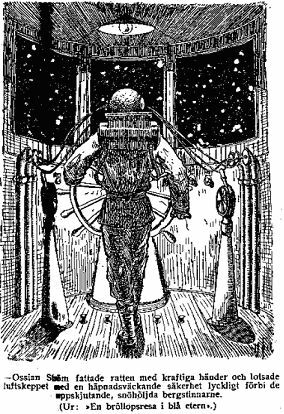 These stories — in which Verne is mentioned — are about Swedes travelling in space and are clearly influenced by Verne’s novels. L'article présente l'impact de Jules Verne sur les lecteurs suédois vers 1900. La recherche se base sur un périodique pour adolescents, Kamraten , publié entre 1892 et 1911. Deux textes épiques martiens ont été récemment découverts dans Kamraten . Ils sont l'oeuvre de l'auteur suédois de récits d'aventures et policiers Julius Regis (1889―1925). “En bröllopsresa i blå etern” (1906―07; “Une nuit de miel dans l'espace”) et “Dokumentet från Mars” (1910; “Le Document en provenance de Mars”) sont le témoignage de la popularité de Verne, qui y est même mentionné. Ces deux histoires de Suédois voyageant dans l'espace montrent une indéniable influence vernienne. Jules Verne was probably the most popular translated author in Sweden in the decades before and after 1900. His influence can be found in a wide range of authors. This paper focuses on a magazine for young adults, Kamraten ( The Comrade ), in which a veritable Verneomania blossomed from its founding in 1892 until it was discontinued in 1911. There was a long catalog in Kamraten of different adventure stories written by Swedish authors, obviously inspired by Jules Verne’s famous books. Kamraten. Illustrerad Tidning för Sveriges Ungdom ( The Comrade. Illustrated Magazine for Sweden’s Youth ) was conceived as a magazine for education, family, and entertainment. From the first issue, starting with the popular British author of juvenile fiction William Kingston’s (1814―1880) Äfventyr i fjärran västern , popular literature in the form of thrilling short stories and adventure stories in serial form played an important part in Kamraten ’s editorial format. Intriguing titles such as “Dödshålans hemlighet” (“The Secret of the Death Lair”, published anonymously in 1902:1―18) caught readers’ eyes and spurred their imagination. Even well-known popular Swedish authors appeared in the magazine. The public’s substantial interest in scientific advancement and in expressing it in literature can be found in Kamraten . Among other things, one notes the famous Swedish engineer Salomon August Andrée’s (1854―97) ongoing experiments with balloon travels also reflected in Kamraten . An anonymous author wrote “En svensk luftseglarbragd” (1893:21) about Andrée’s ascent with the balloon Svea on October 19, 1893 (he conducted a total of nine ascents). The equally anonymous “Till nordpolen i ballong!” (“To the North Pole in a balloon!”, 1895:6) is initially based on Andrée’s experiments, but later turns into pure science fiction. The pseudonymous Zéro gave detailed instructions with drawings and everything for building a full-scale balloon in “Hyfva ballong!” (“Heave Your Balloon” in Kamraten 1896:16―17). “Vingar eller plan?” (“Wings or Planes?”) by the pseudonymous À la Jules Verne (1897:4) is set in “190―” and is about the solution to the problem of flying. The same author’s “En fotografisk nordpolsexpedition” (“A Photographic Expedition to the North Pole”, 1897:10), published on May 15, 1897, is set in in July―September of the same year and deals prophetically with Andrée’s expedition with the balloon Örnen (The Eagle) towards the North Pole. The attempt fails already in the short story: Andrée is forced to land, and finds that two other Swedes, J.A. Björling and E.G. Kallstenius, have already arrived at the pole . Swedish enthusiasm for air travel in Kamraten during the 1890s should obviously be attributed to Verne’s stories and Andrée’s various air travel experiments. Some contributions in Kamraten from the last years of the decade are dystopian stories, though, like the pseudonymous Yngve’s “I tjugonde århundradet. En ‘jules-verniad’” (“In the Twentieth Century. A ‘Jules-Verneity’”). This story is divided into three sections: “I. Ett äfventyr i lufthafvet” (“An Adventure in Space”, 1898:4―5, concerns exchange of fire between American and Russian airships in 1940), “II. Ett framtidskrig” (“A Future War “, 1898:10―11, about a world war that breaks out in 1942), and “III. Förbi med kejsardömet!” (“Farewell to the Empire!”, 1898:17/18, about a Congress in Berlin in 1945 to end the world war) . Jules Verne is back again. Illustration for the anonymously published “Till nordpolen i ballong!” (“Towards the North Pole in a Balloon”) in Kamraten 1895:6. One is reminded of Verne’s debut novel Cinq semaines en ballon (1863). Kamraten ’s appreciation of the French writer is evident from the title of the anonymously published article “De unges favoritförfattare. Jules Verne” (“The Favorite Author of Young People. Jules Verne”, 1894:22). With hindsight, it is easy to be impressed by the accuracy of Yngve’s prediction. Even gloomier is the same author’s “Jordens undergång. En Jules-Vernid” (“The End of the Earth. A Jules-Verneity”, 1899:17), which takes place on October 29, 3499, when a comet destroys Earth . An early international example can be found in H.G. Wells’s (1866―1946) short story “The Star” (1897), which depicts a similar disaster. Other early comet-hits-Earth stories include Edgar Allan Poe’s “The Conversation of Eiros and Charmion” (1839) and Camille Flammarion’s La fin du monde (1993). We recognize the motif from Jules Verne’s La Chasse au météore (1898), which, however, does not end as disastrously as Yngve’s text. The airship subgenre was parodied in the anonymous “Luftskeppet” (“The Airship”, 1901:8), where a vessel crosses the Pacific by air from San Francisco to Honolulu, due to the detonation of the entire cargo, consisting of fireworks. The airship is called Örnen , which of course is another nod to engineer Andrée’s famous aircraft . When Andrée’s expedition vanished in the ice kingdom and was never heard of again, it seems that interest in air trips in Kamraten dwindled. It was only in 1906, with the first part of Carl Berg’s and Julius Regis’s “En bröllopsresa i blå etern” (“A Honeymoon in Space”), that the subject was featured in the magazine again, after half a decade’s absence. Simultaneously, this serial introduced a novelty in the journal: Martians. “KORRESPONDENS (à la Jules Verne)”. Vignette by Ossian Elgström (1883―1950) for the correspondence column in Kamraten 1909:20. “Mars” is written on the left celestial body and “Red. af KAMRATEN” (“KAMRATEN’S Editors”) on the space rocket. Regis’ production of fiction can be traced back to 1906, when he was 17 years old. That was when his adventure novel Djupets vaktare ( The Guardian of the Deep Seas ) was published in Kamraten ’s Christmas issue. Djupets vaktare was the first in Regis’s series of thrilling texts, crammed with foot and car chases, physical violence in different forms, shipwrecks, sieges, shoot-outs and explosions as conspicuous and recurring ingredients . In addition to fantasy and science fiction, Regis wrote crime stories and traditional adventure stories. He was most famous for his stories about the detective and journalist Maurice Wallion, called “The Problem Hunter”, e.g. Blå spåret ( The Blue Track , 1916) and Vargflocken ( The Wolf Pack , 1921). Several of these books were translated into English, German, Danish, Finnish and Norwegian. These stories are thematically (but not linguistically) within or near the so-called hard-boiled tradition. Den försvunna patrullen. Svenska scouter på äventyr ( The Missing Patrol. The Adventures of Some Swedish Scouts , 1923) and Dynamoön. Tre svenskars sällsamma äventyr i Stilla havet ( Dynamo Island. The Strange Adventures of Three Swedes in the Pacific Ocean , 1924) are typical adventure stories (exciting journeys to distant parts of the world). Vägen till Iblîs ( The Road to Iblîs , 1921), set in the Arabian Desert, is a mixture of detective and adventure story. The discovery in 2007 of Julius Regis’s contributions to Kamraten gives us a clearer picture of his literary profile, and of the early phase of the fantasy and science fiction genres in Sweden. In general, Regis was a faithful disciple of Jules Verne’s focus on scientific “plausibility” in his fiction, but in these early works in Kamraten he also emerges as an adept of H.G. Wells and his fantasy-oriented approach by elements like Martians. However, we do find pure “Verneities” about spacecraft and mad scientists as well. The earliest of these stories were published while Regis was still in to secondary school. Regis’s published work in Kamraten consist of three translations, an adaption and nine original works, including two novels in serial form. Under the pen-names J. P:son Regis (for Julius Petersson Regis), Halfdan Svenske, John Peters and JPR he published the following stories: “Djupets vaktare. En jultragedi från hafvets botten” (“The Guardian of the Deep Seas. A Christmas Tragedy at the Bottom of the Sea”, 1906:23/24), “Storsjöodjuret. En julesverniad” (“The Lake Monster. A Jules-Verneity”, 1907:6 and 1907:9), the second and third part of the serial “En bröllopsresa i blå etern. Romantiserad äfventyrsberättelse” (“A Honeymoon in Space. A Romance”, 1907:13―21, with Carl Berg , who had written the first part, published in 1906:19―22), the science fiction story “Isöknens paradis. Ett ögonvittnes berättelse om en sällsam händelse i Nord-Sibirien Julafton 1906” (“Paradise in the Ice Desert. The Account of an Eye Witness about a Strange Event in North Sibiria on Christmas Eve 1906”, 1907:23/24), the Stockholm archipelago story “Devil, motor-racern” (“Devil, the Motor-Racer”, 1908:16), the gangster story “I Camorrans klor” (“In the Clutches of the Camorra”, 1908:21), the science fiction story “Vraket i lufthafvet” (“The Space Wreck”, 1908:23/24), the fantasy/science fiction story “De tre männen från månen” (“The Three Men from the Moon”, 1909:18/19―20), the serial “Dokumentet från Mars” (“The Document from Mars”, 1910:1―22), and the Stockholm archipelago story “Den flygande människan” (“The Flying Man”, 1910:3). These contributions are all related to Regis’s later production. Air and space travel in “En bröllopsresa i blå etern”, “Vraket i lufthafvet”, “De tre männen från månen”, “Dokumentet från Mars” and “Den flygande människan” return in several of his later works. Man’s dream of flying had materialized early in literature: Lucian, Ludovico Ariosto, Cyrano de Bergerac and Edgar Allan Poe are some of the authors who described space travel before Jules Verne. As noted earlier, Regis was strongly influenced by Verne in his adventure stories, those set in the South Seas as well as those set in space. In the serials “En bröllopsresa i blå etern” and “Dokumentet från Mars,” journeys to Mars are an important ingredient; in “De tre männen från månen” an aircraft that has traveled to the moon and back lands, in typical Jules Verne-style; in “Vraket i lufthafvet” a perilous journey to the North Pole is attempted; and in “Den flygande människan”, secret and mysterious military flying experiments are conducted in the Stockholm archipelago. In all these stories, and “Devil, motor-racern”, there are brilliant/mad scientists/engineers as heroes/villains. Elements inherited from Jules Verne also recur in Regis’s later adventure stories. “Djupets vaktare”, “Devil, motor-racern” and “Vraket i lufthafvet” depict shipwrecks, a recurring motif in in the works of the writer. “Den flygande människan” and “Devil, motor-racern” are stories of abnormalities in the Stockholm archipelago. Regis returned to this topic in several works, the most bizarre undoubtedly the hilarious short story “Mannen som kände Storsjöodjuret. Historien om en intervju med professor Burness-Faulcner och om en sportbragd i yttersta skären” (“The Man Who Knew the Lake Monster. The Story of an Interview with Prof. Burness-Faulcner and about a Sports Achievement in the Outer Archipelago” in the monthly magazine Bonniers Månadshäften 1912:11. This short story is about the pursuit of a giant prehistoric plesiosaur in the Stockholm archipelago . Regis had already dealt with this motif in “Storsjöodjuret. En julesverniad” (“The Lake Monster. A Jules-Vernity” in Kamraten 1907:6 and 1907:9), where a bizarre scientist who has invented a specially equipped diving suit confronts a living monster in the northern Swedish lake Storsjön, the description of which conforms to that of plesiosaurs. Regis’s interest in bringing prehistoric animals back to life also resulted in “Isöknens paradis” in 1907:23/24 . Here mammoths still live on the North Siberian mainland and dinosaurs in a warm habitat in a subterranean cave system on an island north of Siberia, unknown to mankind. It is worth mentioning that in addition to Verne’s Voyage au centre de la terre (1864) the most famous text in this subgenre, Arthur Conan Doyle’s The Lost World , was not published until 1912. The serial “En bröllopsresa i blå etern” changes character in three stages. What begins as a self-conscious focus on entertainment — centered around the permanent contributors to Kamraten and especially the illustrator Ossian Elgström under the alias of Ossian Ström — soon transforms into a science fiction story in the second part, with a circumnavigation around the world in an aircraft and the shooting of a projectile to Mars as typical Jules Verneian elements, including a dramatic section in Chapter VIII with a giant squid attacking a boat, also derived from Jules Verne. In the third part the text possibly crosses the genre border into fantasy, since there are Martian humans and Martian humanoids there. Each new part of the serial became more fantastic. The plot of “En bröllopsresa i blå etern” is briefly as follows: Ossian Ström and his fiancée Karin Brander are married aboard an airship, and then leave for a long voyage around the globe. In the South Seas they rescue the Russian engineer Ivan Lubassow from dying on a raft. He was previously acquainted to the Ströms and has in fact always been in love with Karin. The Russian has a secret launching facility at the bottom of a volcanic crater on a deserted island. Lubassow treacherously tricks Ossian Ström and two of his friends into a projectile, and when they are in it, he sends it into space with the help of a stream of lava. The projectile goes to Mars, but Lubassow does not get any opportunity to enjoy the fruits of his betrayal, i.e. Karin Ström: he is charred in the lava flow. All this sounds very James Bond, and it is useful to recall that the plot is from as early as 1906―1907. The third part takes place 25 years later. Ossian and Karin Ström’s son Georg is an assistant at the observatory in Kinnekulle. A space ship crashes nearby, in which there are three skeletons. In a package is found a manuscript called “The Diary of the Skeleton”, i.e. Ossian Ström’s spiritual testament to his son Georg, with an account of his and the two friends’ stay on Mars. They were not crushed when landing on Mars thanks to the friendly inhabitants of the planet, who regulated the projectile momentum through targeted waves. After some time on Mars, the Swedish trio is sent back home, but on arrival in the atmosphere of the Earth an unexpected deviation from the course occurs, and instead of landing the spaceship becomes a satellite circling the Earth for 25 years, before it falls down for unknown reasons, and the truth is revealed. “Ossian Ström took hold of the steering-wheel with his powerful hands and steered the spaceship past the towering, snow covered pinnacles with astonishing confidence.” Illustration by Ossian Ström’s model, Ossian Elgström, for Carl Berg’s and Julius Regis’s serial “En bröllopsresa i blå etern” in Kamraten 1907:13. 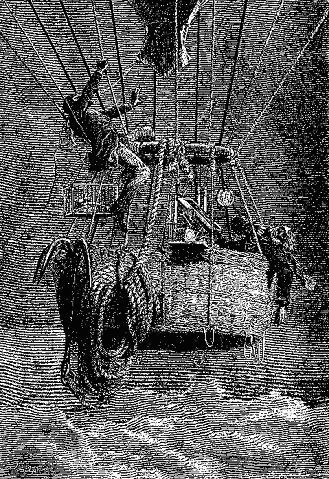 Parts of the action on the space journey probably have Jules Verne’s De la Terre à la lune (1865) as a source for inspiration. In fact, Verne is mentioned already in the introductory chapter (1906:19 p. 298 column 1), but the tragic end (which has no equivalent in Verne’s novel) was probably inspired by S.A. Andrée’s expedition with the balloon Örnen to the North Pole. In 1906―1907 surely no-one doubted that the expedition had failed and that its three participants had perished . “KORRESPONDENS”. Vignette by Ossian Elgström for Kamraten ’s correspondence column in 1910:19, where interest in utopian air trips is emphasized. A few years after “En bröllopsresa i blå etern”, a sequel was published, “Dokumentet från Mars” ( Kamraten 1910:1―22), written by Julius Regis alone. Here fantasy and science fiction themes play a significantly larger role than in the earlier series. Therefore it is necessary to take a more thorough look at this opus than its predecessor. The plot of “Dokumentet från Mars” is briefly as follows: Georg Ström (son of the hero of “En bröllopsresa i blå etern”, Ossian Ström) travels together with his friend Leif Endal in a huge copper bullet from the island of Lidingö, outside of Stockholm, to the capital of Mars, called Equator City. The trip is made possible by the government of the friendly Martians called “the culture people”, using so-called magnetic ether force for transporting the 200 ton copper sphere the 90 million kilometers from Earth to Mars. During a trip to the north pole of Mars, the two Swedish heroes come into contact with the other species on the planet, “the ice people”. These are cave-living humanoids, described as vile, reptilian, with “two thin legs and two thin arms and terrible clawlike fingers, saucerlike eyes and suctorial mouth” (1910:11/12, page 182, column 2). They seem more primitive than “the culture people”, but they possess knowledge of “polar magnetism” (1910:11/12, page 182 column 1), which allows them to put the visitors’ airship out of order. One disaster leads to another, and soon the Swedes, the leader of “the culture people” (who is variously called Chief, Prince of Mars and Prince) and his daughter, the beautiful Nadei (who soon is in liaison with the hero Georg Ström), find themselves prisoners in the enormous cave system of “the ice people”. Having taken the Prince of Mars and his daughter as hostages, “the ice people” now launch an attack on Equator City in an attempt to wipe out “the culture people” and take over the planet. “The Great World War” is specifically mentioned (1910:18 page 289, column 2). At the last moment, the Swedes and the Prince of Mars bring the ambitions of “the ice people” to naught with the help of a hidden weapon, “Strålvapnet” (“The Ray Gun”), which wipes out any trace of a living creatures by pulverizing them to atoms and evaporating them (1910:22 p. 354 column 2). Georg Ström and Nadei are united, but the Prince of Mars is killed by the son of the leader of “the ice people”. In his last moments, the Prince appoints Georg Ström as his successor. Ström thus wins ‘the princess and the kingdom‘, and Leif Endal returns to Earth in the copper bullet alone. By a majority decision, the transport channel between Earth and Mars is closed by the government of Mars. The action in “En bröllopsresa i blå etern” had taken place between 1906 and 1932. The plot of “Dokumentet från Mars” takes up where the previous story left off and continues for about a year and a half, that is, up to 1934. Already a few years before “Dokumentet från Mars”, an epilogue was published, “Vraket i lufthafvet” (1908:23/24), which in the fictional chronology would be set after “Dokumentet från Mars”. Here the reader witnesses Leif Endal’s death in a failed attempt to reach the North Pole, another allusion to S.A. Andrée’s ill-fated journey with Örnen. Obviously, a key question is how original Julius Regis is in his early fantasy and science fiction stories and what motifs he has in common with other authors of the subgenre. Some subjects in his two serial novels are so common to fiction texts or adventure stories (the young man who wins the princess and the kingdom, the unknown race, space travel, the fight between good and evil, strangers who attend a secret Society meeting) that it would be futile to search for potential sources. It would be more interesting from this point of view to examine the elements of (pseudo)technology and (pseudo)science and supernatural elements. In both cases, the presentation approaches the limits of reader interest, but never crosses it. Even the rendered mathematical formula (“15 x + 4 √ 30 ∙ y + 109 Z = A”, 1910:2 page 31) has its conspicuous forerunner in Verne’s Autour de la lune (1870), chapter “Some Algebra”, which gives two formulas of a complexity that makes it impossible to reproduce them here. The entire third chapter of “Dokumentet från Mars”, with the description of the work on the copper sphere, its furnishing, its passengers (the two heroes, a dog, a monkey, half a dozen of small birds) and so on, corresponds to De la Terre à la lune , Chapters 23 and 25, and the fourth chapter’s depiction of space travel also has its equivalent in Autour de la lune (passim). The suffering of the accompanying animals (1910:4 page 63, column 2) has its counterpart in Autour de la lune as well. The weightlessness of the astronauts (1910:4 page 63, column 2) can also be found in Autour de la lune . “― or were they really human beings, towards which we were aiming our revolvers in our initial astonishment?” Illustration by Ossian Elgström for Carl Berg’s and Julius Regis’s series “En bröllopsresa i blå etern” in Kamraten 1907:20 p. 318. Note the Martians to the right and their similarity to the astronauts to the left. The eleventh chapter, “Marsklotets inre” (“The Center of Mars”), with its perilous trek into an infinite cave labyrinth, is reminiscent of Verne’s Voyage au centre de la terre (1864). Another possible source of inspiration for the plot of “Dokumentet från Mars” could be Georgs Méliès’s silent film Le Voyage dans la lune (1902), a concoction of Verne’s De la Terre à la lune , Voyage au centre de la terre and Vingt milles Lieues sous les mers (1869) and H.G. Wells’s The First Men in the Moon (1901). In the film’s opening scene a journey to the moon is planned in a scientific assembly, after which you see a space projectile built, how a group of scientists goes to the moon, where they end up in the captivity of a species of underground creatures, how they manage to escape, and eventually get back to Earth. What about the elements of quasi-technological terminology so typical in science fiction and fantasy? This has been a regular feature in these genres since Jules Verne, who e.g. uses terms like “phonotelephote”,”telephote screen”,”pulsograph” and “piano electric calculator” in the short story “Au XXIXme Siècle. La journée d’un journaliste américain en 2889” (1889, written in collaboration with his son Michel), “electro-cultivation”, “glass concrete” and “fulgurator” in the novels L’Île à hélice (1895) and Face au drapeau (1896). Being a good Verneian, Regis excels in a large number of pseudo-scientific terms. In “En bröllopsresa i blå etern” and “Dokumentet från Mars” he mentions “magnetic ether power”, “thought fluid” and “power currents of the central facilities”. Other (quasi)technological features in “En bröllopsresa i blå etern” are spacesuits (1907:14 page 223, column 2 and 1907:20 p. 318 column 1). It should be emphasized that Julius Regis is virtually alone in his generation to equip his heroes with space suits. In “Dokumentet från Mars” all transport on Mars is by air. No land transport exists (1910:7 p. 110, column 2). The ultimate means of power on the planet is the dreaded “Strålvapnet” (“Ray Gun”), described as an extremely light “opaque glass ball, the size of a child’s head, [...] held by a claw made of an unknown metal”. When it is used, “a sizzling ray spurts out from its top, [...] like a gleaming ray of green light”. When the ray hits something a smell of ozone spreads. The ray dissolves any solid matter, the enemy is anihilated (1910:22 p. 354). Regis inhabits Venus and Jupiter with intelligent beings, with which “the culture people” on Mars have been in touch. Once, they even sent a probe with 16 scientists to Jupiter, but it never returned (1910:10 p. 154, column 2). Comparing “En bröllopsresa i blå etern” and “Dokumentet från Mars” with other Martian stories from the same time, one finds much in common, but even more that is different. Regis’s serials imitate Verne when it comes to (pseudo)technology on a scale not found in any of the compared texts. Concerning scientific terminology, we note that it occupies much more space in Julius Regis’s serials than in any other contemporary Mars story. Another important difference compared to other authors is that whereas Verne, as well as his followers, consistently used Greek elements for new word formations, one finds that Regis is considerably more homespun: he prefers Swedish words. One could sum up by stating that many of the contributions to Kamraten, independent of genre, demonstrate the popularity of Jules Verne in Sweden around the turn of the century 1900.